Ending the physical, social, and economic isolation for people with intellectual and developmental disabilities — by unleashing a global volunteer movement that creates one-on-one friendships, leadership development, and integrated employment – is the core mission of Best Buddies. 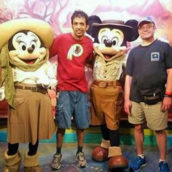 Wayne Reed has benefited from all three of those brand pillars during his time with Best Buddies Maryland. He has been part of the organization’s Friendship Program and is now part of the Citizens Program, where he is matched with his buddy, Jordan. 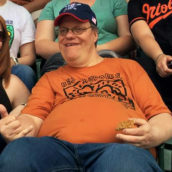 Thanks to the self-confidence and social skills he developed through Best Buddies, Wayne has excelled as an employee of Johns Hopkins Health System in Baltimore since October of 2016. Best Buddies’ jobs team worked with Wayne on his interview and resume and will provide ongoing support throughout his lifecycle of employment. This Thursday, Sept. 13, Wayne will be honored with the Baker-King Award. This is an annual award given to John Hopkins Health System employees who demonstrate truly outstanding job performance and act as a positive role model. Wayne is honored to accept this award and even more excited to be celebrating two years of employment there next month. 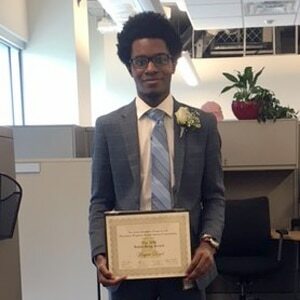 “I nominated Wayne for this award due to his unwavering commitment to the effective and efficient operation of our receptionist area because he is generally the first person our clients, visitors and future employees interact with upon their arrival to our floor,” said Anthony G. Austin, assistant director of Capital Accounting for the Johns Hopkins Health System. 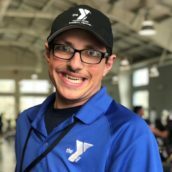 Thanks to the financial independence of having a job with Johns Hopkins, Wayne was able to save up and move into his own apartment this summer, noted Best Buddies Maryland State Director Vince Fiduccia. Wayne will receive his award during an Employee Service Awards celebration on Thursday, Sept. 13, from noon to 1:30 p.m. in the Thomas B. Turner Auditorium at 720 Rutland Avenue in Baltimore. Best Buddies® is a nonprofit 501(c)(3) organization dedicated to establishing a global volunteer movement that creates opportunities for one-to-one friendships, integrated employment and leadership development for people with intellectual and developmental disabilities. Founded in 1989 by Anthony K. Shriver, Best Buddies is a vibrant organization that has grown from one original chapter to nearly 2,500 middle school, high school, and college chapters worldwide. 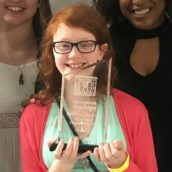 Today, Best Buddies’ eight formal programs — middle schools, high schools, colleges, citizens, e-Buddies®, jobs, ambassadors, and promoters — engage participants in each of the 50 states and in 50 countries, positively impacting the lives of more than 1.2 million people with and without disabilities around the world. In many cases, as a result of their involvement with Best Buddies, people with intellectual and developmental disabilities secure rewarding jobs, live on their own, become inspirational leaders, and make lifelong friendships. For more information, please visit www.bestbuddies.org, facebook.com/bestbuddies, or twitter.com/bestbuddies.